This month I have decided to write a recording review on Everyday Robots (2014), an album (and song) by Damon Albarn which questions the role of technology in our everyday lives. Albarn has been part of the music scene since the early 90s. Starting with his Brit-pop band, Blur, which became very successful with each new album. This led to the creation of Gorillaz, a collaborative project with artist Jamie Hewlett in 1998. That project is a mixture of soul, rock, R&B, electronic, hip-hop and many other genres. Albarn is also generally a collaborative person, often featuring many other artists and giving their voice a place in his projects. He has fused multiple styles and genres throughout all his projects but has remained very unique through all his transitions. Everyday Robots is special compared to what he has done in previous works. It’s his first solo album, which he considers a very personal work. Everyday Robots is a beautiful down-tempo album that combines elements of pop, experimental, trip hop and folktronica. It’s a great album for reflection; the instrumental arrangements alone give way to this melancholy feeling. The vocals are never dense or overwhelming. There’s a lot of space given to fully digest everything happening in each track. The first song, “Everyday Robots,” sets the tone for the album. The instrumentation is carefully placed. There is a repeating string sample, which continues throughout, but real strings later fill out the background –heightening emotions alongside the sample. A piano plays chords on each beat, providing a gentle harmonic accompaniment. Albarn also makes use of light percussive sounds like bottles and sticks. The vocals are approached in an interesting manner – Albarn never forces the lines out, and it feels like he’s talking melodically through most of song instead of singing. Lyrically, the song is very simple yet contemplative. The first line begins with, “We are everyday robots on our phones / in the process of getting home / looking like standing stones / out there on our own.” We can all relate to this experience; the world we live in today allows us to be as connected or disconnected as we like. I think these lyrics depict how cold and lonely that can be when you realize all the people around you who are absorbed into their phones or other technology on a daily basis. Albarn is trying to get at the root of human connection and how our access to technology has perhaps changed that; maybe increased access to each other via technology has in turn made us feel more alone rather than better connected. Another important song on the album is “Lonely Press Play.” Many people who listen to music also use it to cope with loneliness and depression. Albarn says quite a lot with this single line, “When I’m lonely, I press play.” It’s a message about how easy we can distract ourselves from life with entertainment. These days it’s easier than ever to step out of (or into) our heads and all the unresolved feelings and emotions we have. Technology has afforded us the ability to check out of life. The instrumentation accompanies the lyrics in a very sympathetic way. The piano plays chords lightly starting on beat two at the beginning of its phrase, while guitar plays double stops in its own repeating pattern over the song. There are also strings weaving in and out of the mix, playing staccato then sustaining with a crescendo. The tone of this entire album is all about our interaction with our emotions and how technology impacts what we do about them. Negative feelings are unavoidable, but blocking them out with all these forms of entertainment can be dangerous. As I stated before this album is an entirely different approach compared to other projects he’s done and is still working on. With that said, this album is beautiful in so many ways. It’s a well needed friend when you’re feeling unresolved. P.S. Gorillaz is coming out with their new album Humanz on April 28th! An especially elegant blend of art and pop was showcased on two well-known Yo La Tengo tracks; the dreamlike love songs “On Our Way to Fall” and “Black Flowers.” In both, the performance sounded drastically different from the album versions. “On Our Way to Fall” saw xylophone, harmonica, and saxophone creating the accompaniment to lead singer Ira Kaplan’s soft vocals. The most exciting element of the song, however, was the ensemble’s trumpet player and clarinetist soloing during every break in the vocals. And during the performance of “Black Flowers,” saxophone, trumpet, French horn, and trombone replaced the violins that provided the backbone for the album version. In conclusion, Yo La Tengo’s performance at The Town Hall was not only a thoroughly enjoyable experience, but it perfect achieved (Le) Poisson Rouge’s mission statement: to collide art and popular culture and create something entirely new. I went to see a live Japanese percussion concert yesterday and I was not disappointed. 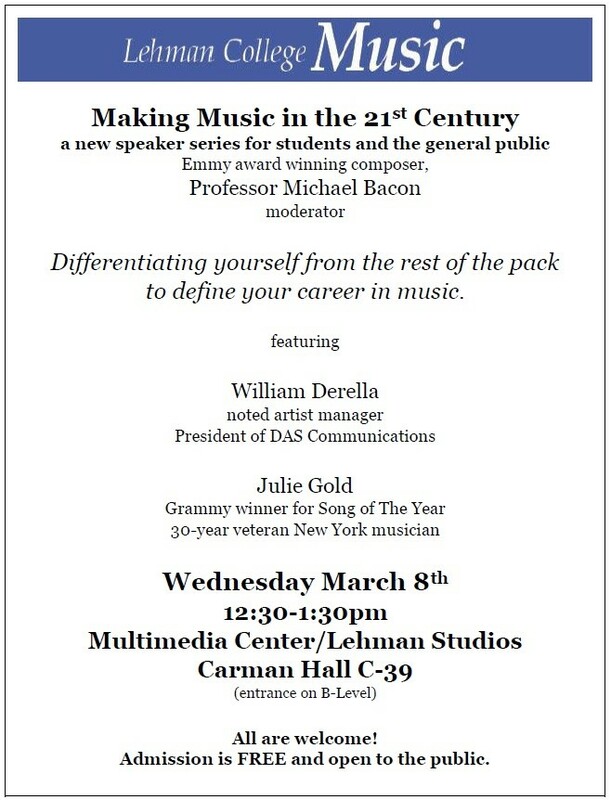 I went to LaGuardia Performing Arts Center with my mother after I found out about this free concert through Carnegie Hall. 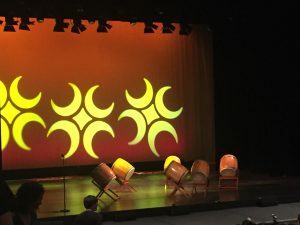 It turns out that this is the 4th time the Soh Daiko concert has been performed it has now become an annual spring concert. The word “daiko” is the Japanese word for drums. Not only was I exposed to music and instruments I wasn’t aware of, but each piece that was played had a story and representation of the Japanese culture. There is a piece called “Shishimai” (“Lion Dance”) is about a shy lion (in Japanese is called “shishimai“) who dances around in hopes of meeting new people and become friends. A man was dressed up in a costume and danced on stage and then off stage to the audience. There was a lot of families in this concert so unfortunately there were more screams from kids and laughters from adults. The performer had a mask that wasn’t a “lion” lion like we are use to see at a zoo, but more of a creature that is similar. He then would open and close the mouth of the mask, as if he were bitting something, which he did to a few audience members because being bitten by shishimai means good luck for the year. (No I didn’t get bit). While shishimai was frolicking around there was music being played by two percussionist, one playing a brass bell and the other going back and forth between two taiko‘s (they looked like snare drums but more wooden and wool that it looks hand made). They played very soft to bring more attention to the lion performer than the music. Another piece where the instruments are just background music to portray a character is in the piece called “Nimba“. This piece is based on the art of Edo Sato Kagura genre, what the announcer told us and it seems that this fisherman wasn’t ordinary. “Hyottoko” is the Japanese word for fisherman but specifically “country bumpkin”. Dressed in regular performance attire except for wearing a decorative mask, the performer throws “bait” at the “sea” which ended up being free candy to the audience. The fisherman’s theme music was different from the lion’s since it was more dancelike but a simple beat. Two percussionist, again one playing bells and the other playing two gaku-drums, where playing while the fisherman gave us a memorable scene. One of my favorite pieces was the “Miyake Daiko” because out of all the performances, the beats and performance on just drums were very loud and overall amazing. There were 5 percussionist in total but only 3 instruments. Three people were playing “miya-daiko” or big drums and the other 2 were playing an odaiko, “big drum” but its literally twice the size of the miya and was played on both sides. I’m so glad I was exposed to so much considering I knew little of Japanese culture and Japanese music. There was an intermission like period where the performers invited kids from the audience to come up on stage and got a brief lesson on the drums. 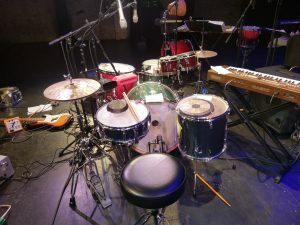 Here’s a picture of a set of drums that were the most used in the concert pieces. A lot of information was found on the program and also explained by an announcer. On March 4th I once again attended the 2017 Ecstatic Music Festival presented by the Kaufman Music Center. The concert featured Thums Up, a collaboration from modern jazz pianist Vijay Iyer, along with the pedal board effects of guitarist Rafiq Bhatia, drummer Kassa Overall, and rap lyrics by Himanshu Suri also known as “Heems.” The concert also featured the hypnotic vocals of Arooj Aftab, who uses classical Pakistani and North Indian vocal melodies combined with Sufi poetry. Aftab also freely incorporates various other instrumentalists into her sonic landscape such as musician Yusuke Yamamoto who played a bass amp-driven synthesizer, drummer Nathan Ellaman-Bell, and Argentinian pianist Leonardo Genovese. The night’s performance began with Arooj Aftab’s blend of ethereal and international sounds. This is the second time I have witnessed a live performance of Aftab, whose music has the ability to accommodate the improvisation and participation of varies instruments. The first time I saw her was on August 11, 2016 at the David Rubenstein Auditorium at Lincoln Center. In that performance, her ensemble consisted of a saxophone, harp, cajon drumming, piano, and bass synthesizer effects. I remember being impressed by how easily jazz, classical, and ethnic elements fused together in her presentation. This performance just as well embraced varies genres and sonic textures. Her lyrics are sung in free time following the tradition of classical Pakistani and North Indian songs, and being such, they float above the modern pulsing and droning synthesizer effects of Yusuke Yamamoto. Together they create a modern hypnotic ambience from the timbre combination of an ethereal voice, which is soaked with a reverb effect on the microphone and the heavy low pulsing synth grooves coming out of a Hartke Bass amplifier. In contrast to the more free form of Aftab, the drummer, Nathan Ellman-Bell, incorporated Latin rhythms with compound meters of 3/4 and 6/8. I suspect he did this in collaboration with Argentinian pianist Leonardo Genovese. Both drummer and pianist showed great chemistry with one another and frequently exchanged smiles as they grooved together. Genovese also displayed chromatic and dissonant sections in his playing, which did not feel over saturated as the tension dissolved easily in the ambience of Aftab and Yamamoto. In fact, the dissonance employed by Genovese served as a nice counterpoint to the mellow and hypnotic lyrics. The dissonance did not become overbearing, but actually enhanced the return to the ethereal realm of Aftab’s long and sustained vocals. This collaboration was a well-balanced allegiance between dissonance and fluid lyrical poetry. The second performance of the night featured Hip Hop lyrics pertaining to the South Asian American experience and political commentary by Queens’s rapper Heems, along with rhythmic piano, beats and effects by Vijay Iyer. 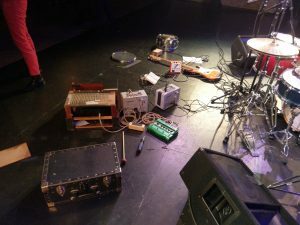 The guitar player Rafiq Bhatia offered different sustained drone and wash effects through an intricate pedal board, which he controlled by an expression/volume pedal. He replicated and created various guitar effects that were labeled as “shoegazing” within the early indie rock movement due to guitar players constantly staring at their effect pedals that they controlled with their feet. The drummer Kassa Overall also had an interesting drum kit as he included bongos and other smaller drums, which he would occasionally play with a padded percussion mallet. The overall sound of the ensemble incorporated Rap lyrics criticizing the over usage of combat drones, the appropriation of Hindu culture by the modern yoga culture, and the South Asian experience of growing up in Queens. The concert ended with the Thumbs Up ensemble inviting Arooj Aftab to join them for the closing number. Once again Aftab provided a hypnotic ambience with her vocals while Heems delivered a higher energy rhythmic rap chorus. 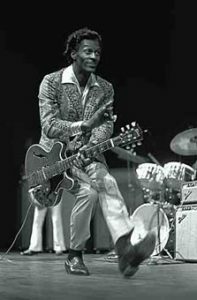 The guitar effects along with the piano effects and drumming also culminated in the climax of the night with much of the audience standing in applause. It was nice to experience a concert with so many South Asian American artists. It stands as a testament to the rich diversity and affluent global culture within the arts of New York City. Tigue is a Brooklyn-based trio with a unique sound that combines contemporary classical music with art-rock. Their most recent album, “Peaks” was described by New York Music Daily as an “imaginative, distinctive, hypnotic yet kinetic blend of indie classical, minimalism, post-rock, and drone music.” Their diverse performance at the Pregones Theatre on March 1st put several of these styles on display. The program for the night consisted of three pieces: An Index of Possibility, commissioned from composer Robert Honstein; New Work, commissioned from composer Jason Treuting; and Quilts, composed by Tigue’s own Keyboardist/Percussionist Matt Evans. An Index of Possibility could be classified as an experimental percussion piece. For the entire piece, which lasted about half an hour, all three members played only percussion instruments. The first “movement” of the piece began with percussionist Carson Moody slowly scraping the circumference of a flower pot with what looked like a screwdriver. After about a minute, Percussionist Amy Garapic began playing a pattern of repeating tones on a xylophone, creating a sound reminiscent of church bells. Evans sporadically added rapid rolls on a glockenspiel. The second segment of the piece began with Garapic loudly striking a bass drum (and almost causing a few heart attacks in the audience). 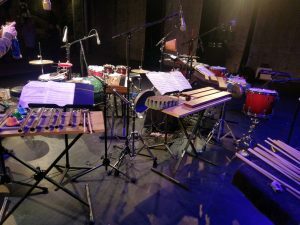 It saw the group break into a fast, steady beat, with the xylophone and glockenspiel alternating between two notes, and the loud bass drum sounding periodically. A third segment had the group return to some of the motives created in the first. Garapic returned to the sound of church bells, with rhythmic augmentation resulting in single notes ringing out for five seconds at a time. Shortly thereafter was an eruption of percussion sounds, created by more traditional instruments such as glockenspiel, bongos, wood blocks; and less traditional “instruments” such as a round saw blade and a bourbon bottle. The instruments were set up in a semi-circle and one could see and hear the beat traverse across the semi-circle and back, each instrument given a few moments of prominence. I found most interesting how the piece blended tonal and atonal elements. There were quite a few moments when a melody could almost be made out before it retreated back into noise. Tigue’s third piece was my personal favorite. “Quilts” is a minimalistic rock-like piece with a danceable rhythm. Evans told the audience that he composed the piece so that both Garapic and Moody could “rock out” on drum sets at the same time, while he played a keyboard with one hand and a shaker with the other. Garapic played what looked like a traditional rock drum set while Moody played one with several bells and cups. The piece was quite repetitive, with Evans alternating between four or five chords for the duration. Likely a result of the minimalism, I noticed my brain filling in the piece with melodic lines that weren’t actually there. I couldn’t help but feel that the mood created by the sustained organ and syncopated drums was very reminiscent of early 2000s post-punk such as The Strokes and Interpol. In conclusion, Tigue put on a diverse and exciting performance that highlighted several different styles and kept the attendees engaged with experimental sounds and audience interaction. In addition to creating an interesting brand of music that allowed audience members to draw parallels to indie rock, classical, and serialism, Tigue succeeded in creating a myriad of different sounds; making it nearly impossible for audience members to not be aurally pleased at some point in the performance. It must have been a great experience to sit down and enjoy the good musical performance of Jaco Pastorius. Pastorius was a virtuoso bass player, who modernized the electric bass guitar playing skills using music theory and his amazing ear training. This concert took place in Montreal, Canada on 1982. The concert was involved with great musicians, which the following were, Jaco pastorius (bass), Peter Erskine (drums), Othello Molineaux (steel drums) ,Don Alias ( congas/percussion), Bobby Mintzer (saxophone), Randy Brecker (trumpet). With no introduction the band starts right of the bat with “The chicken”, a jazz tune composed by Pee Wee Ellis and made famously by jaco Pastorius. The band performed the piece different than the original. They have incorporated new modern rhythms and made it into a funky jazz tune. I guess they have been influenced by other musical styles that were around in the 80’s. As usual in jazz performances, every musician gets to solo in the performance. I was amazed the way Bobby Mintzer (saxophone) started off the solo using a tenor saxophone. Even though Mintzer was performing with a tenor, I’ve noticed a lot of Charlie Parker movements in his solo. Using a lot of chromatic ideas in his solo Mintzer managed to layout an incredible solo. Now one thing I found unusual were the steel drums. Aside from being an amazing bass player, Pastorius was also an experimenter which tried new instruments in his ensembles. I’m guessing Jaco replaced the jazz vibraphone with steel drums in order to receive a new sound and identity to his ensemble. Othello Molineaux (steel drums) did not only bring a Caribbean instrument into the performance, he also played an incredible solo on the first piece. He incorporated a lot of funky blues and jazz scales which is a usual role of the vibraphone in jazz. On the next piece, Bobby Mintzer grabs his bass clarinet and performs a spectacular solo by himself which leads slowly in to “Donna Lee”. Donna lee is a famous jazz tune composed by Charlie Parker on alto sax. But again, Jaco made the jazz tune even more famous when he performed the saxophone part on electric bass guitar. Donna lee is a fast tempo Bebop tune which I found really amazing when trumpeter Randy Brecker, played the melody line, as it was no big deal. Aside from playing the melody, he also laid down a great solo. As anyone would noticed, Brecker performed the same accents as the alto saxophone does in a solo, which I believe would be more difficult on the trumpet than the Saxophone. Finally, Jaco Pastorius gets his own chance to solo by himself and shows the crowd his best. He starts his solo by using harmonic notes on E minor while having a percussive bass rhythm in the background accompanying his solo. After his percussive solo, he slightly goes into the chord changes of “America” which he performs as a solo piece on the electric bass. Jaco Pastorius is considered the best of all time. Not because of his experiments, but because of his musicianship. It must of been great witnessing a great bass player with a great jazz band, live. The nine Southern African Zulu members of Ladysmith Black Mambazo[i] quietly walked on stage and took their places behind their microphones. One microphone stood in front for the leading tenor and eight microphones stood behind. All members were clothed in matching blue and black dashikis and black trousers. 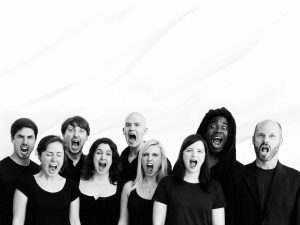 In their home language, Zulu, the bass, alto, and tenors sang a cappella in major diatonic harmony in the Southern African choral genre, Isicathamiya. I sat in first row of the second balcony and listened to their soft yet sonorous voices resonate throughout the auditorium. Following the first song, one of the tenors introduced the founder and songwriter of the group, Joseph Shabalala[ii]. He then introduced Shabalala’s youngest son, the youngest member of the group, Thamsanqa. He sang lead for their song, “Awu Wemadoda,” a song from a past album that was rerecorded for their newest album, Walking In The Footsteps Of Our Fathers. In 1960, Joseph Shabalala formed a choir he named Ezimnyama[iii]. By 1965, Shabalala had developed the group into Ladysmith Black Mambazo, an established and competitive Isicathamiya[iv] and mbube group that included only family and friends of Shabalala. It was not until the late 1980s that they began to win Grammys and gained international recognition thanks to their work with Paul Simon on his 1986 album Graceland. In this performance at Carolina Theatre, LBM sang renditions of two songs from Graceland, “Diamonds On The Souls Of Her Shoes” and “Homeless,” which are featured on the new LBM album. Joseph Shabalala and other members took turns giving short introductions to most songs, sharing the intended messages of each. Their messages were quite succinct when sung in English, including songs such as, “All Women Are Beautiful,” “Tough Times Never Late,” and “Long Walk To Freedom.” While introducing “Long Walk To Freedom,” the lead tenor expressed the song was a celebration of twenty-two years of democracy in South Africa after the end of the Apartheid[v] policy, a system of aggressive racial segregation and discrimination. The song is dedicated to Nelson Mandela and named after his 1994 autobiography. LBM and Mandela supported each other and their efforts to bring peace to South Africa. Mandela even asked LBM to accompany him at several of his ceremonies including his acceptance of the 1993 Nobel Peace Prize for human rights. LBM incorporated light dancing in their performance including hand gesturing and footwork, which seemed to accompany the messages in their songs. They even involved some charming comedic acting to lighten-up the audience. To help the audience embrace their culture, they taught us a few Zulu phrases. Most of LBM’s songs were in the key of F# with diatonic harmony in a two-octave range of major triads, and a chord progression of I – V – I or I – IV – V – I. The singers would often slur in an upward motion to the first tone of a melodic phrase. The choir sang without a conductor and while most of the songs were in common time with syncopated rhythms, there were also songs that were difficult to measure because they were so expressive. The singers would make great use of their vocals like tongue rolling and click consonants from Southern African languages. They also used the clicks for rhythmic purpose in some of their English language songs. In the midst of songs the members would call out to each other in Zulu, sing birdcalls and other animal sounds, rhythmic humming, and whistling. This expressive form of singing and rhythm could be compared to some of the music we have been studying in class. LBM’s last song lasted approximately fifteen minutes and was mostly the repetition of one phrase as members took turns having fun with expression, poking fun at each other, dancing, and encouraging the audience to sing along. Many songs were repetitious, repeating the same phrase with little change in dynamics. However, the repeated phrases always had a steady and continuous flow with a rhythmic pulse and a message; a desire for equality, kindness, compassion, and peace.